CleanMedia brings together "clean" or family-friendly ads with family-friendly websites. 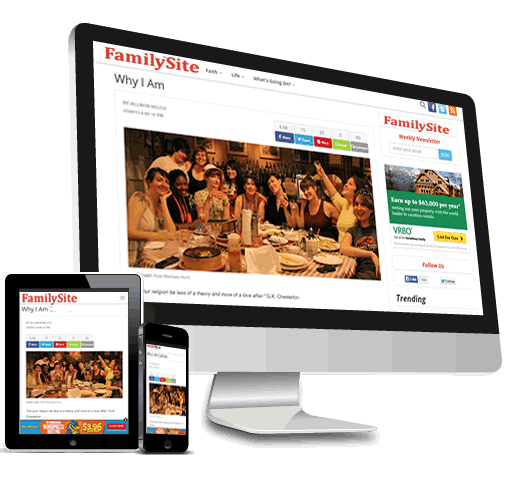 Our ad networks reach millions of family-friendly visitors per month. Many of our publisher websites have not been accessible to advertisers in the past because of other ad networks inability to guarantee appropriate ad content. CleanMedia runs 3 specialty banner ad networks catering to Christian and family-friendly publishers – CleanAds.net, ChristianAdNet.com and CatholicAdNet.com. These publisher websites and their visitors are sensitive to inappropriate ads, and CleanMedia assures "clean" ads for them by manual filtering all ads and landing pages. CleanMedia deals directly and often exclusively with hundreds of publishers allowing us to be a LOW COST alternative to other ad networks, which often deal through aggregators and middlemen. increase your traffic, develop brand awareness, and reach a relevant audience. We deal directly with hundreds of family-friendly publishers cutting out aggregators and middlemen resulting in a LOW COST alternative to other ad networks. Our publishers include Christian and family-friendly websites, many of which have not accepted ads in the past because of fear of inappropriate ads. The family-friendly demographic is highly engaged and generally has above average income levels. Get what you pay for. Unlike other networks you are only charged for the ads that are viewed by a real person. generating high Return On Investment (ROI) from family-friendly content. We have 3 family-friendly banner ad networks targeting different demographic groups. Whether you are placing an ad or publishing a site -- we ensure that both ads and websites are clean and family-friendly. All ads and publisher sites are screened to make sure they are not offensive or contrary to a perspective consistent with Christian values. Whether you are placing an ad or publishing a site -- we ensure that both ads and websites reflect Catholic teaching. Average demographics for the whole network. Placing Clean Ads on Family-Friendly sites. CleanMedia.net is a family-friendly media company that connects clean ad content with family-friendly websites. CleanMedia.net is owned by Clean Media, LLC. Any realized profits will be donated to Christian evangelizing charities. CleanMedia.net was founded by Robert B. Trussell, Jr., the retired founder and CEO of Tempur-Sealy International. He has served as a member of Tempur Sealy International's Board of Directors or its predecessors since 1992, and has served as Vice Chairman of the Board of Directors since April 2006. He has had a lifelong interest in thoroughbred racing and breeding. He lives with his wife Martha in Lexington Kentucky. Currently Bob is involved in various Catholic evangelization projects and is chairman of Catholics Come Home Inc, Clean Media, LLC, and Real Life Radio 1380AM & 94.9FM (Lexington, KY's only Catholic Talk Radio Station).